Many people have been having this choice of which Tecno Phantom to go for after the launch of Tecno Phantom 6 and Phantom 6 Plus. Today, i have taken my time to make this post to differentiate between Phantom 6 and Phantom 6 Plus. Tecno Phantom 6 and Phantom 6 Plus looks alike in design, both runs on Android 6.0 Marshmallow and Tecno's custom user interface --HiOS--. They both share the same pre-installed apps, feature USB Type-C port, fast charging feature, eye scanner, 4G LTE support, and they both have a Metal unibody design. But still yet, there are differences between both phones. That's why they are tagged Beauty and the Beast. Below are the listed difference in both phones. I have tabled where Tecno Phantom 6 and Phantom 6 Plus has edge over the other. It's now easy for you to spot out the difference between both Flagships of 2016. In conclusion, Phantom 6 has support for memory card, versatile rear camera that can utilize depth of field to produce pictures with bokeh effects, has a sharper display, it's slimmer and handier. You can equally check out the full specifications of this phone Here. While Phantom 6 Plus has a big screen display as it packs 6inches screen. Good for multitasking, big battery capacity, feature a fingerprint scanner, but unfortunately, there is no slot for Memory card. You can equally check out the full specifications of this phone Here. 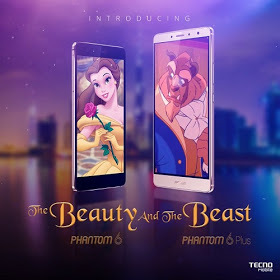 That's all about the difference between Tecno Phantom 6 and Phantom 6 Plus #BeautyAndTheBeast. I hope i have clearly differentiate the differences between these two Tecno Flagships of 2016. Which do you think you can go for?